The player is visiting the Greek island of Thira, and in something of a break from tradition, there isn't a crisis immediately at hand. The game's intro text is a bit of a giveaway, as it talks about discovering a gateway to Atlantis, but the game proper starts with the player on the streets of Thira, as an elderly Greek offers us a mule. We're wearing faded jeans and a T-shirt, with nothing else in inventory, and we can see a volcano far to the west. If we fail to take the mule within a few turns, the owner wanders off with his animal. North of the starting location is our hotel room, with a bed, wash-basin, towel rack and wardrobe. We can't TAKE TOWEL, so Douglas Adams' famous advice will have to go unheeded here, but we can OPEN WARDROBE to find our suitcase, which can't be taken but can be opened in turn to reveal a bather (bathing suit for us Yanks) and a box of matches. Further examination yields a pair of goggles, so we're suited for swimming, if not deep-sea diving. South of the main street is a general store, with a sign reading, "CHEEPIST PRICES U CAN GOT" (ethnic dialect gags you also got), where we can pick up an underwater torch (the flashlight variety) and a knife. Well, "pick up" oversimplifies the case -- we can't GET TORCH, as Stealing is something that is not done on a Greek Island, and we have no money to BUY it at the moment. We'll have to come back. While visiting the fountain in the main square to the east, A barefooted youth stops to greet you. In his hand he is carrying a pair of sandals. TALK YOUTH indicates that The youth can't speak English, but he keeps pointing to his legs. Does he need pants? We can REMOVE JEANS, but we are promptly arrested for indecent exposure in a public place, ending the adventure. So that's not a good idea... not that it seemed to be one at the outset, really. 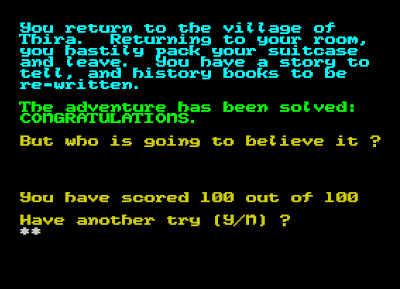 Starting over, our attempt to TAKE MULE is rebuffed as The Greek goes on a bit about Speccy adventurers who try to "get" everything they see. We can't BUY MULE either, so perhaps this is just a set-piece gag. Let's try changing from the jeans into the bather inside the hotel room -- the boy will now accept the jeans in exchange for the sandals. Incidentally, our T-Shirt reads, "I LOVE LAURENCE CREIGHTONS [sic] GAMES" -- though we can only find this out by EXAMINEing SHIRT, not READing it. We've explored the local area now, consisting of just the four locations, so where else can we go? There's a sharply zig-zagging path going down the mountain, with a pole next to it -- the pole has a sign reading, "MULE STOP. PLEASE KEW FROM RITE. A MULE BE A LONG KWIKLEY. U WAIT." We can't GO PATH, so let's see if we can find the right words to make use of the public transportation. RIDE MULE almost works, but we don't have any money... oops. With a start, followed by a re-start, I discover that we did have some drachmas in our jeans -- which I gave away without having checked on the previous try. The drachma supply appears to be practically infinite -- we can BUY TORCH, BUY KNIFE and RIDE MULE and still have Some drachmas in inventory. The mule takes us safely down the path, as the Greek mutters something like "ZEUS", with color emphasis on the ZEUS. We now find ourselves on a volcanic beach -- there's another mule stop here, should we need to return to town -- and the hot black sand makes the sandals well worth wearing. There's a spade here, but we can't dig on the beach and there are no obvious exits. There's also an 8-item inventory limit, so we may have to do some juggling from here on in. The torch bears a warning that its switch is faulty -- once on, you cannot put it off, so we'd best conserve its power. We can SWIM out into the Aegean sea, where the salty water burns your eyes until we WEAR GOGGLES. The water is clear, revealing the sea bed deep below. I probably should have left the matches behind -- they're now a soggy box of matches, but nothing else appears to be damaged, so I'll restore and leave them on the beach before going in, along with the drachmas which seem unlikely to be of use outside of town. SWIM DOWN just takes us back to shore (where we discover that even though we didn't take them in, the matches have gone soggy? Ah, they toggle back and forth every time we go for a swim -- it's just a state handling bug, and we don't actually need them for anything, as it turns out.) To approach the sea floor, we need to DIVE. It's very dark and murky down here, so we need to SWITCH ON TORCH. It took me several turns to find the right phrase, and now we're out of air; fortunately it didn't take as long to figure out that we can SURFACE to breathe. So we won't be spending any great amount of time down there. The torch only lasts about 30 turns, so we're going to need to map out the sea-bed and find a spot to dig. W, E and DIG seems to work -- when we surface, we always dive back to the starting point of the maze, so this isn't too messy. We find a stone in the only diggable spot, which can be TAKEn, and going S from here discovers the entrance to an underwater cave. Some kelp prevents us from entering the cave, and the knife is not quite sharp enough to CUT KELP. Actually, Mr. Creighton's emphasis suggests that it is JUST not quite sharp enough. The stone is a whetstone, so can we SHARPEN KNIFE -- How? -- WITH STONE? No, that doesn't work. Can we RUB KNIFE WITH STONE or SHARPEN KNIFE ON STONE? Nope. I finally had to consult a walkthrough (thanks yet again, CASA!) to determine that we have to STROKE KNIFE to sharpen it. As we enter the cave, a portcullis falls down and, startled, we drop everything we brought along except the bather. So this is in essence Part 2 of the adventure -- the segmentation is not due to memory constraints, it seems, but perhaps for design simplification. The second part of the game is quite a bit larger than the first part, so everything up to this point has been a sort of prologue. We're now in a breathable area, the remains of ATLANTIS, where we find a large piece of sponge and a pool of sea water. Heading W, we find the remains of a magnificent marble chamber, and a passage leading down to an ancient shrine once managed by LESKOS the Priest... whose body still lies prostrate here. He's not dead, we discover, but in suspended animation -- apparently if we can restore his Holy Ring to his finger, which has been chopped off, he will be returned to life. So we should probably do that, then. East of the shrine is the priests' robing chamber, and passages to the south and east lead to other areas. The Guards' Quarters contains a wineskin, and the Guard Room contains a living brute of a guard who won't let us access the dungeon downstairs. The Priests' Chamber to the east of the robing area contains a small altar and a page of a hymn, reading, oddly enough, "If it's worn, will keep you warm." The nearby vestry contains a cupboard with a golden cloak inside, most likely what the hymn was referring to, but we can't just GET CLOAK as it is retained by two strong iron bars. West of the shrine is an intersection leading to a tool shed, containing an axe that's so old it disintegrates when we try to pick it up; an oxygen plant, leading to a slimy maze we'll try to navigate later; and a garden, ritual site and torture-chamber area, where a jar of acid is of the most immediate interest. West of the torture chamber is a freezing ice chamber at minus 80 degrees Celsius, so that's probably why we need the golden cloak. We can't POUR ACID or USE ACID or DISSOLVE BARS or EMPTY JAR or THROW ACID to dissolve the bars, though. We can map the slimy passage maze (S, S, N, N) to find a dismembered finger, and if we pick it up we can see that it bears the ring we're looking for. We can try to PULL RING -- You pull and tug, but the ring refuses to come off. I can't seem to find my way back out of the maze, so it seems that obtaining the ring might be important. We can PUT FINGER, and the parser assumes we want to put it into the jar of acid. The finger dissolves, but now the ring is in the jar of acid, so we can DROP JAR to smash it and retrieve the ring... except, no, it seems to disappear completely when we do this. And we can't GET RING without losing a few fingers ourselves. I had to resort to the walkthrough again to find out that the slimy maze uses the oldest trick in the adventure design book -- we can go SW from the end of the maze to end up back near the well, in defiance of all observation and geographical consistency. But this isn't completely unfair, as other rooms we've visited earlier have employed diagonal directions; it's just that all the other navigation in this maze is limited to N/S/E/W. What else? We can DANCE at the ritual site to open up a gaping hole in the ground, leading to an underground cavern sporting a single candle and a passage to the southwest, as well as steps leading back up. We can't GET CANDLE, and we have nothing to light it with, but we also can't go southwest without a light source, so we'll have to come back later. Referencing the walkthrough -- again -- I learn that we can't take one of the hooks described on the walls of the priests' robing chamber until we EXAMINE CHAMBER and "discover" a small hook. Even with this tool in hand, GET RING doesn't work -- we have to USE HOOK to retrieve the priest's Holy Ring from the acid. Now we can PUT RING and wake Leskos from his slumber -- he wants a password, and ZEUS is the only thing remotely like one we've encountered so far; fortunately it works, as long as we just type ZEUS and don't attempt to do something stupid like SAY ZEUS. The revived priest jumps straight into tour guide mode, giving us a brief history of Atlantis (earthquake, sinking, advanced technology) before tipping us off to the real mission here -- the nation's King is held prisoner. He's probably in that dungeon we attempted to visit earlier, if I had to guess; the priest gives us a piece of flint, always a useful adventuring item, and we're left to our own devices again. So now what can we do? Is there anything to light with the flint? There's that candle down below the ritual site, but we can't reach it, let alone light it. And the parser still won't let us travel southwest at that location -- being able to strike the flint doesn't count as a light source. After trying to GO WELL and CLIMB WELL earlier, I found we can JUMP to go down the well -- fortunately we land on some soft sponges, and there's a worn but useable ladder going back up. There's another spade here, as well as a low crawlway here, through which we can CRAWL to enter a forgotten passage with a rope in it. Returning to the upper level, we learn that we can't DIG in the hard garden ground with our spade, but if we fill the wineskin with some sea water from the cave entrance, we can EMPTY WINESKIN to soften the soil into diggable mud and find the King's Crown. It doesn't impress the guard, though. What about the area below the ritual site? We can't JUMP to reach the candle, but HELP suggests, "If only you had a trampoline..." We can DROP the large SPONGE I've been carrying around since we got to Atlantis, and then JUMP -- the sponge crumbles to dust from the landing impact, but we managed to knock the candle down while we're in the air. Now we can STRIKE FLINT -- it gives off one huge spark, and is gone forever, but it does light the candle in the process. This allows us to access a dark gloomy cave, where we discover a diamond necklace and a westward passage. This passage leads to an echo chamber -- we can't have any ZORK-ian fun by SAYing ECHO, unfortunately, but we can go further west to find a beautiful golden chamber. There's a wooden key here, and a short golden peg protruding from the wall, as well as an interesting area across a chasm too wide to jump. A sign reads, "DON'T ENCUMBER YOURSELF. NO ONE WILL STEAL ANYTHING LEFT HERE" -- which might mean this is a safe spot, or that taking anything from it will be dangerous. We can GET KEY without any apparent consequences, though. That peg looks like we ought to hang the golden robe on it, but we don't have it yet. The necklace, we note in passing, is "fit for a queen," which sounds potentially significant. Can we hang the cloak on the hook in the golden chamber? HANG CLOAK and PUT CLOAK don't work, nor does DROP CLOAK. We can, however, TIE ROPE to the peg, and then SWING ROPE -- though the aging rope crumbles away, so it's a one-way trip, at least via this mode of transportation. We land in a small chamber, where we see a rusty dagger and a gold coin. The coin bears the head of a king on the one side, and a bridge on the obverse. We can't FLIP COIN, or BITE COIN to see if it's made of magical flight-enabling chocolate, or READ COIN for more details, but if we RUB COIN it expands into a bridge. So I guess we came here for the dagger, then. We can't GO BRIDGE but we can CROSS BRIDGE; it crumbles away after we do so. Okay! Now we can go rescue the King -- we SHOW DOCUMENT and the brutish guard is fine with us going down into the dungeon (we'll have to do this every time -- the guard is either dedicated to duty or has a bad memory.) In the cell, we find a pair of sandals, a round lump of clay, and THE KING, as well as a wooden door -- with no keyhole or doorknob, so the wooden key doesn't appear to be useful at the moment. The king is reportedlyin a state of Suspended Animation. Only his crown will awaken him. I don't have it with me, and my candle has gone out, so I can't go back where I left it; I've got to restore and retrace my steps once again. Back on track, we PUT CROWN on the king, who fulfills his plot function with impressive royal brevity: "You have awoken me - now I will give you some of my treasure as your reward." But then he realizes the Queen is not here, and he becomes petulant and irritable - "I'm not giving you anything if the Queen is not here." So we have to track her down also. The clay lump on the floor is too large to pick up, and we can't PRESS KEY into it or MOLD CLAY into a likeness of a keyhole, or the Queen, or even Freddie Mercury if we're really reaching. Hmmmm. Can we use the wooden stick to pry it up? No, but we do note that it's large, heavy and round, and some experimentation reveals that we can use the Spade to LEVER CLAY -- it rolls and smashes down the wooden door, turning it into a mutilated door with no key required. The queen is tied to her bed, by the wrists and legs, which is a disturbing sight even without paparazzi hiding in the bushes. Examination indicates she will only awaken with her royal necklace. I retrieve it from where I left it during my inventory juggling up to this point, and a simple PUT NECKLACE wakes her up. She's still tied down while I try to figure out how to rescue her -- CUT ROPES prompts, "I say, could you rephrase that?" and UNTIE QUEEN doesn't work. We have to FREE QUEEN to slash the ropes with the rusty dagger, which is what we were originally trying to do. She thanks us briefly and goes off to see her husband. Whew! Behold Atlantis is not a painfully difficult adventure, but it's a substantial game that took some time to play through -- it has plenty of locations, many puzzles, and a good deal of annoying backtracking and parser wrestling in the old-school tradition. I enjoyed the trip -- while there isn't much of a plot here, the atmosphere is well-handled, and there's a lot of incidental humor. I'll have to track down more of Laurence Creighton's work in the future; he wrote quite a few adventures for Zenobi, and I like his style. My wife and I completed the main story of Borderlands 2, but fortuitous timing of the Steam Summer Sale allowed us to acquire Gearbox's Season Pass downloadable content package at a reasonable price. So we'll be exploring the more exotic areas of Pandora for a while yet; Sir Hammerlock's Big Game Hunt is currently on deck. After a long period of diving in for short bursts, I finally focused on finishing Zeboyd Games' 16-bit-style RPG Cthulhu Saves The World. I really enjoyed this old-school game -- the writing has a sense of humor, the visual and audio style are in the classic SNES mold, and they've done away with one "classic" mechanic I sorely do not miss, by automatically healing everybody up after a successful battle instead of forcing the player to remember to do it manually. The same developer's earlier Breath of Death VII is now on my to-play list; they've also taken over the Penny Arcade game series as of episode 3, so if I ever get through the second episode I look forward to Zeboyd's take on the adventures of Gabe and Tycho. While I was visiting my brother in early July, I helped him get properly accessorized for PC gaming. So he and I and occasionally my wife have been voice-chatting and playing Sonic & All-Stars Racing Transformed, Castle Crashers and Dungeon Defenders together online. Steam > Skype in our household. Now we just need to get his wife on board for a little chatting and kibitzing. From the ever-growing backlog department, I've started working my way through EA's 2008 survival-horror title Dead Space --but I must be getting old, as my longstanding suspense tolerance circa the original Resident Evil is starting to fail me. I'm finding that an hour or so of dodging mutated/alien creatures bursting from the floors and walls followed by panicked plasma cannon fire is about all I can take at one go, so this is going to take a while -- I'm currently nearing the end of Chapter 2. I've also been spending some time with a number of shorter-engagement titles -- Mortal Kombat Arcade Kollection, the Gundemonium series of Japanese bullet-hell shooters, and Puzzle Quest. I also picked up Dragon's Lair during the Steam sale, though some Microsoft video codec problems are currently rendering it only half-playable (the bottom half of the screen, that is) so I won't be taking it seriously just yet. And I've started up Fallout 3 again -- I played it for a while on the XBox 360 a few years back, but allowed myself to be tempted away by other games, mostly because I was getting frustrated by the (completely appropriate) scarcity of resources. I'm tackling it again on the PC, with more focus on scavenging skills, so I'll see if I'm more successful this time. The interface now feels a little clunky and the 3-D models are decidedly low-poly by 2013 standards, but the game's universe is compelling and I'm happy to be spending some time there again. 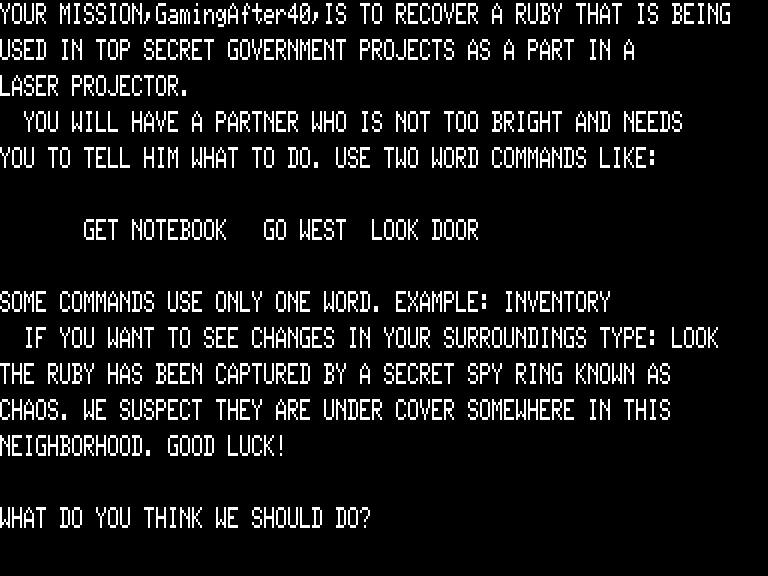 The player's goal as a secret agent is to recover a ruby being used to construct a deadly laser device; the game posits an unusual avatar mechanism, suggesting that "YOU WILL HAVE A PARTNER WHO IS NOT TOO BRIGHT AND NEEDS YOU TO TELL HIM WHAT TO DO," but this doesn't really manifest in the gameplay, and we're in control of our "self" or a "puppet" as usual. We begin standing on a BUSY STREET near a tall office building, with a CIA identification badge in inventory. We can't navigate anywhere else, but we can GO BUILDING -- only to catch a brief glimpse of the lobby, with a large sculpture and a pair of sliding doors, before the doorman decides he doesn't like something about our appearance and throws us out. We have to DROP BADGE and re-enter, taking advantage of his evidently poor memory and/or eyesight. To the east of the lobby is a DINGY ANTE ROOM with a LOCKED WOODEN DOOR. To the west is the VISITOR'S ROOM with a VIDEO CASSETTE RECORDER, which we can EXAMINE to learn that THERE'S NO POWER FOR IT; we can't OPEN it either. On the second floor we find a COFFEE MACHINE, with which we can't seem to do anything interesting yet. To the south is the CAFETERIA with a LOCKED MAINTENANCE CLOSET. West is a SECURITY OFFICE with a PORTABLE TELEVISION and A BANK OF MONITORS. The only interesting thing to see is on the monitors, where we can observe: A METAL PIT 1000'S OF FEET DEEP ON ONE MONITOR. ON THE OTHER SIDE OF THE PIT, I SEE A LARGE HOOK. This is probably a clue we should note. The key from the elevator can be used to unlock the maintenance closet, where we find a variety of items - a PLASTIC BAG, a BROOM, a DUSTPAN and a PAIR OF RUBBER GLOVES. We'll take the gloves for now. Returning to the first floor, we find that we can also UNLOCK the wooden DOOR to access the COMPANY PRESIDENT'S OFFICE, with an ELABORATE PAPER WEIGHT and AN OLD MAHOGANY DESK. The paper weight is heavy, but we can take it with us, and the desk contains a LOCKED DRAWER that can't be opened with the key -- IT'S STUCK. PULL DRAWER yields only, and confusedly, I DON'T SEE THAT HERE. Going back to the maintenance closet on the second floor, we soon encounter the game's five-item inventory limit, so we'll probably have to come back after we know more about the puzzles ahead, or better yet, pick up and drop everything that might be useful in the elevator, where these items won't be too far out of reach. Using the elevator to reach the third floor, AN ALERT SECURITY GUARD in front of a SOLID LOOKING DOOR throws us back into the elevator. Carrying the broom and dustpan fails to allay his suspicions, and we don't get an opportunity to do anything else while we briefly set foot outside the elevator. So what else can we do? We can take the portable television to the visitor's room, and while we can't CONNECT the video cassette RECORDER, we can CONNECT TELEVISION to hook it up. But we still can't START RECORDER, as it remains without power. The sculpture in the lobby can't be examined or moved, or broken. The VCR is the old-fashioned kind that can't be moved. We can't PUSH FOUR or PUSH ZERO to access any such "hidden" floors. We can WEAR GLOVES, but that doesn't make us look any less suspicious. Can we somehow make the security guard less alert, by BREAKing the coffee MACHINE? I'M TRYING TO BREAK IT, BUT I CAN'T. Hmmmm. Can we OPEN BAG? Nope -- I CAN'T. IT'S TOO STRONG. Also interesting. Aha! We can use the heavy paperweight to BREAK DRAWER in the mahogany desk, revealing a LARGE BATTERY and a SPIRAL NOTEBOOK. 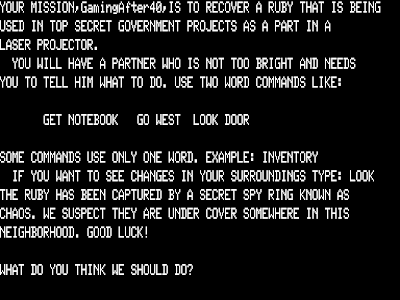 READ NOTEBOOK cryptically reveals, "WE HAVE DISCOVERED ONE OF CHAOSES [sic] SECRET WORDS. IT IS: BOND-007-. TO BE USED IN A -TASTEFUL- SITUATION." This could be useful, and also provides the obligatory unlicensed James Bond reference required of all vintage spy adventures. We can now INSERT BATTERY -- TELL ME, IN ONE WORD, INTO WHAT? -- RECORDER to power up the VCR. But START RECORDER still does nothing interesting -- maybe there's no tape in it. "TASTEFUL" appears not to refer to the coffee machine, but typing BOND-007- in the cafeteria opens a trap door, leading to a SUB-BASEMENT where we find some STRONG NYLON ROPE. To the east of the sub-basement, we find ourselves at the ENTRANCE TO THE SECRET COMPLEX, though how we can discern this remains unclear; one doubts there is a sign. Perhaps we know this because we sense that to the east we will find the SECRET MONITORING ROOM, where the monitors reveal A ROOM WITH A CASE ON A PEDESTAL IN IT. South is the ledge of the METAL PIT 1000'S OF FEET DEEP seen earlier, and with that bit of foreknowledge we can THROW ROPE -- TELL ME, IN ONE WORD, AT WHAT? -- HOOK to snag it on the hook. The engine's behavior is a little misleading here -- the rope disappears from inventory, and we can't SWING ROPE or CLIMB ROPE, so I thought I might foolishly have tossed it across the pit; it's not immediately clear that we can just GO ROPE to swing to THE OTHER SIDE OF THE PIT. From here, a LONG CORRIDOR leads through a NARROW CROSS CORRIDOR to a SECRET LABORATORY containing a BOX WITH A BUTTON ON IT. We can take the box, and because we can't resist PUSHing the BUTTON, we are relieved that nothing happens at the moment. East of the long corridor is a LARGE ROOM with a SMALL PAINTING -- A PICTURE OF A GRINNING JACKAL, on closer examination. We can TAKE PAINTING, and a SMALL CAPSULE falls from the frame; we can't figure out what it is, but it might come in handy so we'll take it along. Continuing south, we find a CROSS EXAMINATION ROOM on the way to the OFFICE OF THE CHIEF OF CHAOS (fortunately for our mission, the secret complex seems to be deserted today.) West of the office is a SMALL BATHROOM where we find only one item -- a RAZOR BLADE (memory restrictions meant that often only salient details were described during this era.) To the south, we find ourselves NEAR THE END OF THE COMPLEX, and can acquire a CHAOS I.D. CARD. In the CHAOS CONTROL ROOM, there's a large button on the wall, and we can PUSH BUTTON -- though the parser decides this means the one on the box, which in a magical scientific flash of transportation returns us to the street outside the building where we began the adventure. I hadn't tried to OPEN SCULPTURE, and doing so now produces a BLANK CREDIT CARD and a QUARTER. We can buy a CUP OF STEAMING HOT COFFEE from the machine on the second floor, though we can't seem to INSERT CAPSULE into the coffee. We don't need to, though, as the third floor security guard is happy to accept us with our CHAOS ID badge in hand. Now we can EXAMINE DOOR to spot a slit near the solid-looking door, but the guard won't let us insert the blank card into the slit. We're also apparently in some danger -- the parser begins to warn us, "I THINK THEY ARE ON TO ME.... I HEAR NOISES." Traveling south into a SIDE CORRIDOR leads to a POWER GENERATOR ROOM with a SMALL METAL SQUARE ON THE WALL along with a lever and a sign reading, "WATCH OUT! DANGEROUS!" We can PULL LEVER anyway -- THE LEVER GOES ALL THE WAY UP AND CLICKS. SOMETHING SEEMS DIFFERENT NOW. The security guard is still alert, though. Drat... oh, we can DROP CAPSULE -- which "accidentally" allows it to fall into the coffee, and even though we just drugged the beverage standing right in front of him, the GUARD TAKES MY COFFEE AND FALLS TO SLEEP RIGHT AWAY. Now we're free to insert the card into the slit, which reveals an electronic lock. We can't PUNCH 2 or PRESS 2 or ENTER 25463 or UNLOCK DOOR, though, and the guard starts waking up after a while. I had to track down a walkthrough to discover that the magic parser words are OPEN LOCK (thanks, CASA!) which prompts, WHAT'S THE COMBINATION? -- and if we get it wrong, the guard has more time to wake up and shoot us. Dang, I thought I had it? Ah, the spaces are significant -- 25463 is wrong, 2 5 4 6 3 is correct. The door slowly opens, and now we can enter a HALLWAY MADE OF METAL, leading to A SMALL PLAIN ROOM and in turn to A SMALL SOUND PROOFED CUBICLE -- with the glass case on the pedestal we glimpsed earlier -- at which point sirens go off -- and guards run in to shoot us to death. So we're still not quite there. Have we somehow tipped off the enemy too soon, is that what the I THINK THEY'RE ON TO ME messages are about? I had to look at Mr. Lampert's BASIC source to learn two key things. One, if we take more than 375 moves to finish the game, THEY'RE ON TO ME, and at turn 400 the game is over as the guards catch up. Two, I needed to push the button on the wall at the end of the Secret Complex to keep the sirens from going off, so I really needed to drop the magic transportation box before trying to PUSH BUTTON there, as the parser otherwise assumes we mean the one on the box. Starting over for the sake of efficiency, we get to the room with the glass case before they're on to us, and can use the razor blade (diamond, is it?) 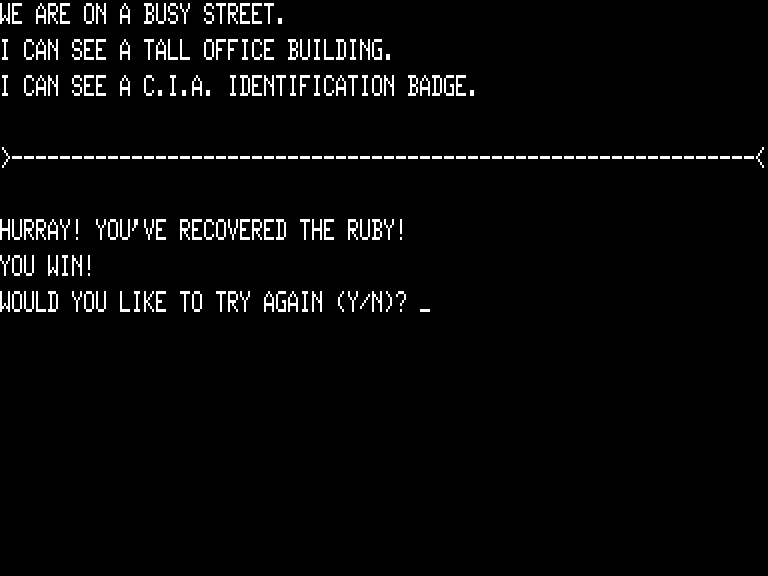 to CUT CASE to remove the VERY LARGE RUBY. But a secret door has slammed down behind us, and there are no other exits, so we're still stuck. Restoring and trying to bring the push-button transportation box with me, I run out of inventory slots and try to DROP CARD. I fail to notice that I've dropped the credit card instead of the CHAOS ID card, and when I drop that to free up an inventory slot, the unconscious drugged guard still manages to throw me out. Dang! Getting everything right on the umpteenth attempt, at last we manage to get into the room before the guard wakes up, and before any other guards arrive, cut the case, grab the ruby, and push the magic button to escape to the street. Victory is ours! 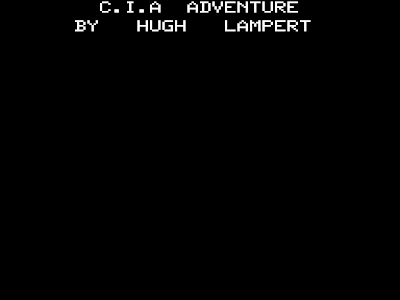 CIA Adventure is a good example of TRS-80 era design -- it squeezes lots of gameplay into a minimal map using a limited parser dictionary. And it's an entertaining and fairly challenging game, although some of the challenges are admittedly due to parser conflicts handling words like BUTTON and CARD that could have been avoided with more distinctive terminology. 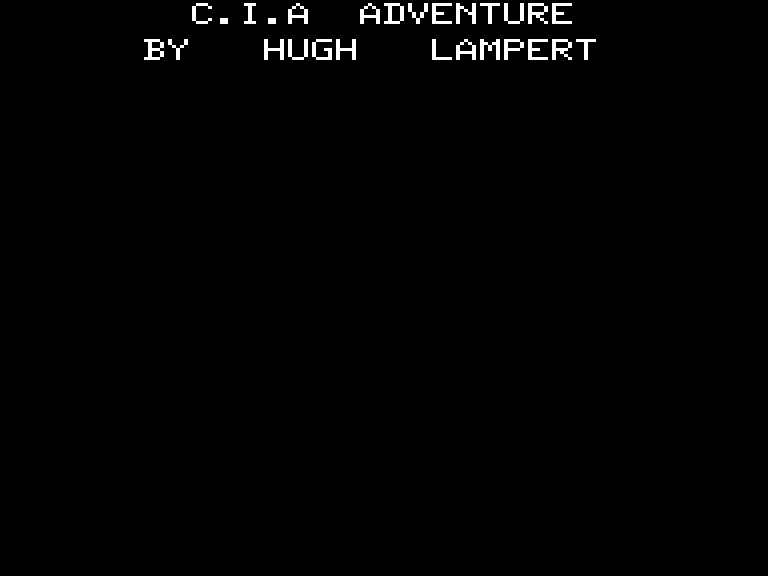 As far as I can discover so far, Hugh Lampert didn't write any other adventure games, but I enjoyed this one-off effort despite some frustration during its complicated ending. Good stuff. This post is going up slightly late due to your editor's advancing age -- I thought I had finished editing this entry, but I hadn't! This week, we're tackling Roger M. Wilcox's adventure number fifteen, King of the Jungle, written for the TRS-80 in 1981 and converted to Windows in 2012 by the original author. 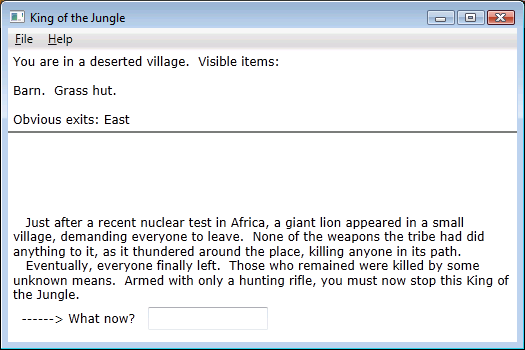 This one features a fairly original plot, or at least an entertaining mash-up of several less original concepts, as a giant lion has chased all the residents and their useless weapons out of a small African village following a nuclear test. The player must now take on the beast, armed only with a hunting rifle. We begin in the deserted village, with a Very high powered rifle in inventory, near a Barn and a Grass hut. To the east lies more of the village, where a Dead native lies on the ground near a Sturdy cabin (apparently the indigenous people have imported some modern building materials.) Oddly, EXAMINE NATIVE reveals that His body's intact, but his head is hollow! SEARCH NATIVE discovers a scrawled note (in his head? ), introducing some science fiction elements by suggesting that the lion is a mutation, and the "giant" form is "only his projected image in a material form, therefore none of our weapons could harm him." (We accept this without direct evidence because the author of the note explains in a preface, "I am a psychic.") The back of the note features a blurb promoting Wilcox's Medieval Space Warrior, in the grand Scott Adams tradition. South of the eastern edge of the village is a Strange dark stream; east is the foot of a mountain. Before we explore further, let's go back and check out the barn, where we find a Cow, a Hand churn, and an Empty bucket. We can GET BUCKET, MILK COW, and CHURN BUTTER to yield a Bucket of buttermilk. The grass hut contains a Medicine kit, and an armory room with a Scruffed-up shield and a Sparker. We can't USE SPARKER or SPARK STREAM, so I guess the dark stream isn't oil. Inside the cabin, actually an abandoned wizard's quarters, we find a Held portal, an Ancient scroll, and a Rod of cancellation, so we may conclude that there will also be some magic afoot. It's not a good idea to READ SCROLL just yet, though, as A silvery line extends from your finger, and ignites a fireball in midair -- leaving us with a Blank scroll, so this is a one-shot deal and it seems wise to restore to an earlier save. We've found quite a few objects and are now running up against the seven-item inventory limit, so we'll drop the hand churn. It's time to assay the mountain, after observing the Bamboo trees in the bamboo nursery north of its foot, though there doesn't seem to be anything we can do with them yet. Climbing the mountain isn't a challenge -- we can just go U to reach its top, where we find a Hole in the ground and a Shovel. It's wise to EXAMINE HOLE, as we see a deep pit with snakes at the bottom. GOing HOLE regardless leaves us dead at the bottom of a fifty foot deep pit, with no need for the snakes to contribute to our demise. With the shovel, always a useful adventure game implement, we can DIG everywhere to see what we find. We discover a Dirty old rope at the foot of the mountain, and... nothing anywhere else at this point. We can now TIE ROPE -- To what? Hmmmm. Trying to tie it to most things yields only, Sorry, it slips off. Hmmmm... make that pretty much everything. Only BAMBOO seems to be an interesting response -- You aren't holding it -- so can we obtain some? Shooting the bamboo trees with the rifle isn't allowed, and the fireball doesn't do anything to it, nor does the sparker. So... a third stanza of hmmm. Time to investigate the source code, methinks... and, aha! We can BREAK BAMBOO to obtain a Bamboo pole -- and temporarily exceed the inventory limit, until we consolidate a few items to end up with a Rope tied to pole. Now we can GO HOLE to climb down to a point in mid-air above a deep pit, and go D, where... You're attacked by man-eating snakes! You're dead. Drat, I almost forgot about those! Restoring, we can easily climb back up, or we can try to do something about the snakes. The fireball remains unhelpful -- this location in mid-air and the fireball appearing in mid-air are not a pair of clues, it seems. Except... ah, we can AIM... Aim what?... AIM FINGER... Specify a direction... AIM DOWN. Reading the scroll with these preparations in order indicates that Nothing could survive such a blast -- and now we can reach the newly snake-free bottom of the pit, where, of course, it's too dark to see. We can't light the sparker -- but can we make a torch somehow? The dark stream remains obstinately non-flammable. There's still that Held portal in the wizard's quarters... we can't OPEN PORTAL or use the rod of cancellation, but TOUCH PORTAL turns it into a simple closed door that can be opened in the normal manner, to access a small walk-in wardrobe closet. Here we find a Pot of oil and a Piece of fine cloth, and we can just LIGHT POT (with the sparker I assume) to create a viable light source. Now we can see that the bottom of the pit has charred walls (probably from our great ball of fire) and a passage leading south. Here, at a T intersection, we meet the = Giant snake king =, apparently in town on some sort of royal diplomacy junket, or here to undermine the normal specist stereotypes about the King of the Jungle. Is its upsizing mechanism similar to that of the Giant Lion? We haven't much time to wonder, as shortly and randomly The snake's eyes shoot beams of coherent light at you! -- which readily penetrate the shield. So we probably need to do a little maintenance on our sole piece of armor -- we can't RUB anything, according to the parser, but we can POLISH SHIELD to establish that It is now shiny chrome. The snake won't let us leave, but the shield does deflect the laser beams he's firing at us, buying us a little time to think. And we can AIM SHIELD to bounce the beams back at the snake, destroying him with a nice bit of descriptive action: His head falls, then his whole body vanishes before his head hits the ground. Now we're free to explore some more. There's a narrow crawlway with rocky walls and ... a Radiation field to the west... and a Temple to the east, built in haste, then abandoned, where there's a statue of a lion that... is holding a piece of cheese? We can't seem to use the fine cloth with it -- okay, yes, I was thinking "cheese cloth" -- and Empty bucket gets rid of the buttermilk to no apparent effect. Can we CANCEL FIELD or WAVE ROD or USE ROD to clear the radiation field with the rod of cancellation? DISPEL FIELD yields only, Use a device to do your dispelling. You're no wizard. Trying to just GO FIELD yields a near-instantaneous conventional-epidemiology-defying death of cancer. The medicine kit contains a strong anti-toxin, but we can't seem to separate it from the kit? DRINK ANTI causes death from heartburn/ulcer, but if we DRINK BUTTERMILK first we seem to survive. We still can't go into the radiation field, though. We have to also drink from the dark stream (by filling the bucket and then DRINKing the LIQUID thus obtained) before we can enter the field -- and now, of course, we're in the cave lair of the lion, and The lion attacks you with a mental blast! You're mindless -- and dead, or at least unable to continue. So how do we distract the lion? The buttermilk isn't going to be available, it seems, and it seems we can't TAKE CHEESE from the lion statue. Ah - we can TOUCH CHEESE, and apparently as long as we have the Rod of cancellation in hand, the statue cheese simply falls to the ground. 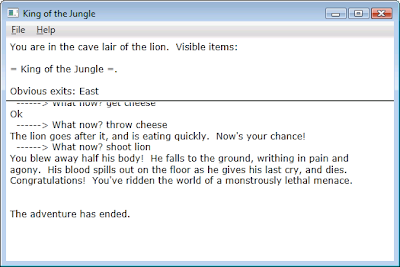 Now we can enter the lion's lair, take advantage of his animal instincts with a discreet DROP CHEESE, and while he's eating it, SHOOT LION -- except, no, he wasn't distracted enough to keep us from being torn apart after he stops the bullets with his mental powers. Ack! 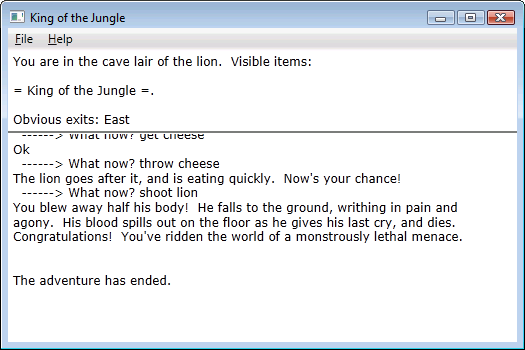 We can't always drop the cheese successfully either, at least not in time, so this bit of action seems to be randomized a bit. 'Twas beauty killed the beast. Awwwwyeah. I've been away for some vacation time, so there will be a brief delay while I catch up with life before I resume my usual adventure gaming shenanigans. But I visited my brother and his wife in Fort Worth, Texas, and on my last night in town they took me to the unique Barcadia, a more-or-less normal Fort Worth bar with bar food, drink, and pool tables. The place also sports a giant Connect Four-style game on the patio, and an oversized communal Jenga stack. There are also several Skee-Ball lanes, and most relevant to this post, a small but working and well-maintained collection of classic early-1980s arcade games! Best of all, every Tuesday night everything is set to free-to-play, requiring a restart and a wipe of the high score tables. And even then, all the locals have apparently tired of playing these machines, so it wasn't too hard for me to post embarrassingly low top scores on several classic machines! 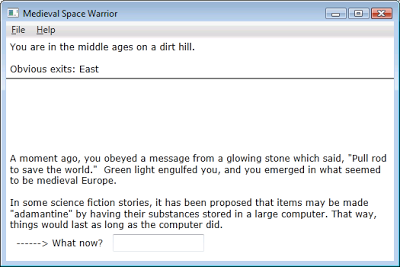 This week, another foray into the Roger M. Wilcox archives comes up with his fourteenth TRS-80-to-Windows text adventure, Medieval Space Warrior, originally written in 1981 and ported to modern PCs in 2012. We arrive at the story's beginning having recently obeyed a suggestion to Pull rod to save the world, and via some sort of green light we now find ourselves in medieval Europe; the intro also hints that "In some science fiction stories" items can be stored digitally for the long term. We begin somewhen as well as somewhere -- in the middle ages on a dirt hill, with a single visible exit to the east and an Iron rod in inventory, presumably the one we pulled to arrive here. Examination doesn't reveal anything special about the rod, but we can DIG (no shovel required this time) and discover a Gold nugget. The glasses are fairly thick and magnifying, it seems, as we're told That wizard must have been incredibly myopic on further examination. We can't WEAR GLASSES, due to the blurriness. DIGging again on the hill discovers another gold nugget, but this is probably a bug, as further digging keeps moving the nugget from inventory to the ground, so we probably won't need it. EXAMINE CASTLE reveals that A stone is loose, and if we PULL STONE we discover that it was the keystone as the castle crumbles, leaving nothing but Castle rubble behind. We can enter the pile of rubble to discover a Huge black vertical shaft (shut yo' mouth!) and a portable Wooden log. We can GO SHAFT, to find ourselves at its bottom, with glowing walls; we can PUSH WALLS, but You pushed it so hard that it short-circuited! You're fried to death by a zillion angry purple sparks! Taking the hint after a restore, we discover that TOUCH WALL transports us to a cylindrical transport tube. There's a touch panel inside; we can also go east to the "reception" room of a space craft, where an Armed alien is stationed. Trying to sneak past the alien, we're likely to be shot, and in that case Your central nervous system suddenly doesn't want to cooperate. Restoring again, we learn that we can TOUCH PANEL to return to the medieval area, but that doesn't do us much good. The parser won't let us HIT or KILL or TALK or SHOUT ALIEN, or USE ROD to give him a good whack. EXAMINE ALIEN reveals only that It looks like every other space alien you've ever seen. We can attempt to BREAK GLASSES to get an old-fashioned TRS-80 BASIC gag, as the text reads BREAK IN 250 / READY. But the game continues with the glasses intact. GIVE NUGGET just drops it, while the alien continues to try to shoot at us, missing most of the time, though he doesn't want the glasses either. HELP reveals only that I know the noun "MAINTENANCE." Hmmmm. Going back to medieval times, we can dig on the pile of rubble to find an Ancient forging furnace, with a lever on its side. We PULL LEVER and we have a working forging furnace, allowing us to FORGE ROD and create a Pointed rod. Returning to the alien spacecraft, we learn that we can't STAB ALIEN, and he still occasionally shoots us, but we can THROW ROD and obtain his Beam rifle, which he won't be needing now that he's an Alien impaled on rod (shut yo' mouth again!) The next room contains another alien, and we can't retrieve the rod from its current position for reuse, but we can SHOOT ALIEN with the beam rifle -- Got him! Boy, he was a terrible shot by comparison. We can't just open the portal, of course, but examination of the second dead alien turns up some Sheet music and a Strange alien helmet, too small for us to wear. We can't PLAY MUSIC but we can SING MUSIC -- though that doesn't open the portal, nor does it seem to do anything anywhere else. What about that hint? We can't EXAMINE or OPEN or CALL MAINTENANCE; trying to FIX MAINTENANCE cryptically says that You don't have a frame. Frame? Well, we can GET LENSES to remove the Concave lenses from the evil wizard's glasses, and there are purple lenses in the alien helmet, which we can remove by doing a second GET LENSES. Oddly, FIX FRAMES indicates that You don't have the right kind of lenses after we have popped out the originals, but once we have the alien lenses in hand, FIX FRAMES creates a pair of Dark purple glasses. We can WEAR GLASSES, and now It's too purple to see! -- and this seems to apply everywhere we can go right now. Hmmmm. Ah -- I had to look at the source code to figure this out. I had EXAMINEd the MUSIC earlier, but we can actually READ MUSIC to see a series of notes on a Gregorian staff: RE MI DO DO SOL. SINGing each of these notes in the prescribed sequence, instead of just generically singing the music as I had tried, opens the portal. 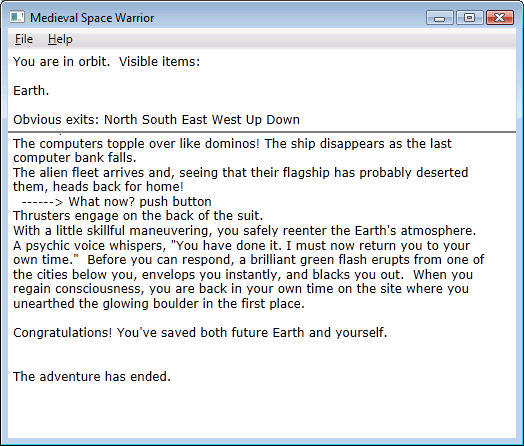 Now we can enter an east-west hallway with a Viewscreen at one end, showing an alien fleet approaching earth -- It will arrive in 200 centons, though this seems to be a fairly lengthy timeframe, at least more than one turn per centon, and I discovered no actual countdown to worry about. The east end of the hallway has a Floor hatch, a Gigantic stone statue, and another closed portal with a shiny circuit protector near it. The statue bears a sign reading, "THE MASTER." We can't open the hatch or the portal easily. 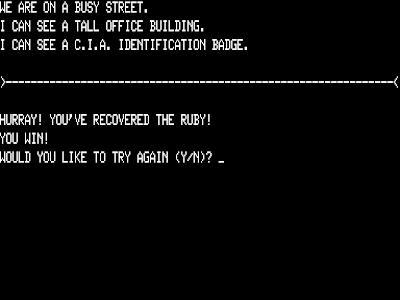 I had to cheat and look at the source code again -- and even then, it took a little bit of work. We can't BURN LOG or FORGE LOG, but we can SHOOT LOG with the beam rifle to produce a pile of ashes, then RUB (wait for it... ) ASHES (shut yo' mouth!) on the shiny circuit protector to make it a Sooty circuit protector, and then SHOOT PROTECTOR to clear the portal. Past the portal is a dark room, where we see the glowing face of the Master. The purple glasses don't seem to do anything here, but we are free to come and go, and we can leave the room and CLIMB STATUE to discover the Statue's single ruby eye. We can't take it, but we can see that The ruby is circular, and then TURN EYE -- You hear a grrrrsphydink from below. Hoping that grrrrsphydink is onomatopoeia and not monstergonnaeatcha, we climb back down to find the hatch open, granting passage down to a lower storage room. Here we find several items of interest -- an Adamantine space suit, a Normal space suit, a Strange cylinder, and a Strange unlit light. LIGHTing the strange light and wearing the purple glasses in the Master's first chamber, we can now see an exit to the east -- and the Master still makes no attempt to inhibit our movement. We can travel through a twisting hallway to reach the Master's second chamber, where yet another closed portal blocks progress. The cylinder we found down below reads, "THROWING CHARGE" -- so it seems natural to THROW CHARGE. It hits the portal and goes off, and now there's a Highly charged force field where the portal used to be. No further puzzles here -- we can simply GO FIELD, and now we're on a ledge in a large domed room. Going down leads to the main computer room, with Rows and rows of computers. Do we want to disable them? We can't SHOOT COMPUTERS, but the intro said something about adamantine, so let's bring that space suit here. It has a button on it. We PUSH BUTTON, and Thrusters engage on the back of the suit. They fling you around a bit, then shut down. Not particularly useful at present. Remembering the earlier hint, I tried to OPEN MAINTENANCE, etc. again -- but as it turns out, this is more of a magic word than a service or hidden panel. We SAY MAINTENANCE, and then A mechanical voice intones, "PERMANENCY DEACTIVATED." Interesting, but what does that mean? We still can't SHOOT COMPUTERS, but -- aha! -- we can now PUSH COMPUTERS , and The computers topple over like dominos! As a direct result, apparently, the alien ship disappears -- and with it, the adamantine space suit we were wearing! It's a cold and lonely death for the player, but at least the primary objective has been accomplished back home -- The alien fleet arrives and, seeing that their flagship has probably deserted them, heads back for home! 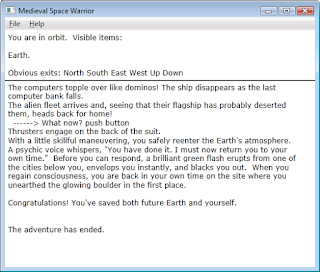 There's quite a bit going on in the story of Medieval Space Warrior, and I enjoyed the ride, even if a few of the puzzles seemed as loosely thrown together as the title. 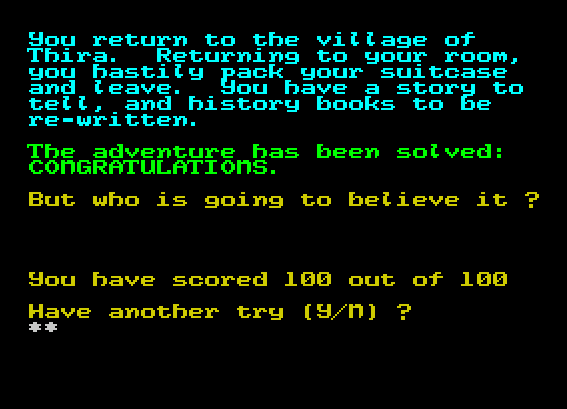 It's really a shame Roger M. Wilcox's adventures didn't see commercial publication back in the early 1980s when they were written -- the Scott Adams influence is clear, as with almost every adventure game published at the time, but young Wilcox had his own freewheeling style. I've been enjoying these games, and we still have quite a few to go.